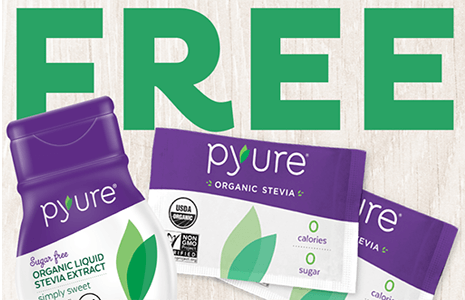 Get a FREE Pyure Organic Stevia Sample at select Walmart locations starting March 8, while supplies last! Find a participating Walmart store. Enjoy the organic way to cut back on sugar with Pyure Organic Stevia! Made from the stevia plant, Pyure Organic Stevia is an organic, zero-calorie substitute for sugar. Pyure packets sweeten like 2 tablespoons of sugar, and are perfect for coffee, tea and smoothies!